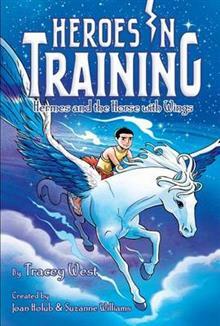 Zeus and the Olympians are tasked with finding a magical horse in this Heroes in Training adventure. When Zeus meets a young boy named Hermes, he claims to have their next quest from Pythia, the Oracle at Delphi. But he wants something for the information: Zeus must hand over the winged sandals he took from Perseus after their last battle. What he doesn t know is that Perseus had stolen those sandals from someone Hermes! Could those sandals be another magical object? When Hermes starts to fly, Zeus knows they have found another Olympian for their group and Hermes lets Zeus know their next adventure will be to find the force that sings. Since Pythia never tells them exactly the right words (her glasses tend to get a little foggy), they figure out that they are supposed to find the horse with wings. With the help of a reluctant Hermes and another new boy named Ron, the Olympians are off in search of a winged horse with a few surprises along the way! Joan Holub has authored and/or illustrated over 140 children's books, including the Goddess Girls series, the Heroes in Training series, the New York Times bestselling picture book Mighty Dads (illustrated by James Dean), and Little Red Writing (illustrated by Melissa Sweet). She lives in North Carolina and is online at JoanHolub.com. Suzanne Williams is a former elementary school librarian and the author of over seventy books for children, including the award-winning picture books Library Lil (illustrated by Steven Kellogg) and My Dog Never Says Please (illustrated by Tedd Arnold), and several chapter book and middle grade series. She also coauthors the Goddess Girls and Thunder Girls series with the fantastic Joan Holub. Visit her at Suzanne-Williams.com. Craig Phillips has been creating cover art and drawings for books, comics, and magazines for nearly two decades. He is most at home working on tales about myth and magic. His latest book-Giants, Trolls, Witches, Beasts: Ten Tales from the Deep, Dark Woods-is a 200-page graphic novel about just that! It will be in stores in May 2017. When he is not drawing and writing, he likes to swim in the lakes and walk in the forests and mountains of New Zealand. Visit him at CraigPhillips.com.au.